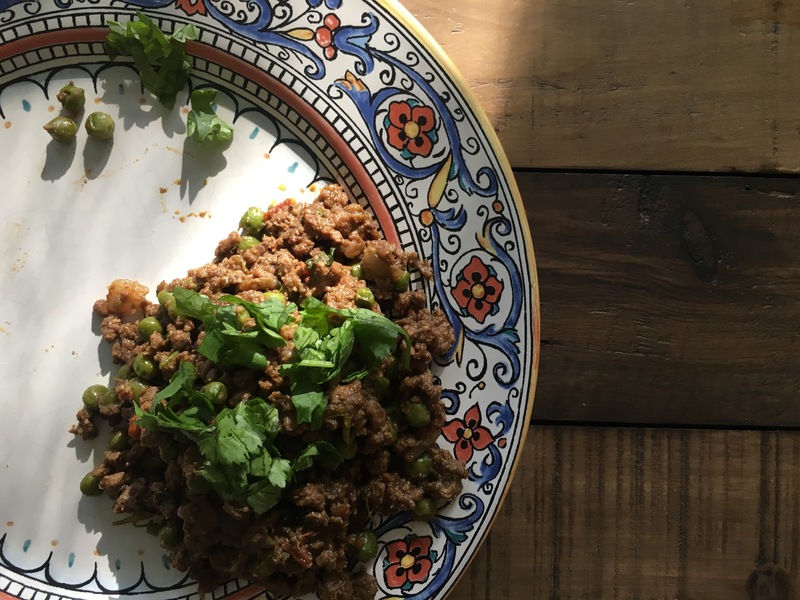 Qeema or minced meat is a popular dish in Pakistan cooked in many variations such as Aalo Qeema (minced meat with potatoes) and Qeema Matar (minced meat with peas) etc. This Qeema recipe is for both Qeema Matar and Aalo Qeema. So let’s get started! Growing up, my mother did not eat Qeema therefore I was never interested in the dish myself. However I got married to a guy who LOVES Qeema. I once tried to buy minced meat at a local meat shop in Canada and was really turned off by the smell. My husband was happy to eat the dish when his mother came over to visit and cooked it for him (along with freezing a year’s supply) or at dinners over at friends and family (where he would specifically ask for qeema to be added to the menu if encouraged even slightly). I might not love Qeema but I love a challenge so decided to tackle Qeema. Firstly I bought cubes of veal meat that I minced in my own food processor so that I could be sure of what all went in it. Secondly I tried a few recipes and found this particular one to be the simplest and the most delicious. This recipe is from the book “Heirloom Recipes from Pakistan” compiled by the Pakistan Women’s Association of the Philippines. This book is just amazing and each recipe is narrated through years of experience. Below is the recipe from the book itself. I will also type it out with a few of my variations for your ease. Add all the ingredients to a large pan and bring to a boil. Let it simmer for 30 to 45 minutes. Turn the heat to high, cook until the water evaporates. Add oil to the minced meat from step 1 and fry over high heat for five minutes. Add the tomatoes and fenugreek leaves and continue stirring. If the mixture starts sticking to the pan, take one cup of water and add gradually as you fry to prevent the ground meat from sticking to the pan and burning. Fry for 15 to 20 minutes. Add the garam masala powder and the peas and fry for 3 to 4 minutes. Cook for 2 to 3 minutes until the peas are cooked (If making Aalo Qeema add the chopped potatoes and fry for 3 to 4 minutes and then add another cup of water, mix well and turn the heat down and let it cook till potatoes soften). Add chopped fresh coriander and adjust any seasonings. Remove from heat. Hope you enjoy this Qeema recipe! Let me know if you make it! I love eating Qeema now and with parathas. How do you like to eat it? So happy to hear from you! Lots of love! Wish I could make this myself for you! 😍 take care! Great site. Qeema can be fairly simple to prep. Fry onions add qeema (2lbs) saute till water is dry, add ginger garlic (paste or crushed) saute anther few mins and then add spices (black pepper, crushed chili , salt and cumin powder all a 1tsp each). Saute a min and then add tomatoes, green chili to taste till dissolved with a bit of water to keep moist. Hope that helps.